the imbroglio – Page 2 – The ratio of people to cake is too big. Texting has surpassed email, phone, and face-to-face conversation as the main communication vehicle for 12-17 year olds. And girls 14-17 years old send 100 texts/day? Really? These data, along with the fact that the source of the data is apparently not the least bit important, suggest we should just give up on the future. It’s not going to be pretty. Just a few notes on the way to the cigar stand: Judges who pay attention to what people are wearing in court only make themselves look ridiculous and make us all lose respect for the judiciary. Similarly, stories speculating about whether law school is a bad investment are ridiculous because the evidence is overwhelming: Law school is a horrible, very bad, no good investment, and something people should do only if it would kill them not to, which is to say, something no one should do, ever, anymore. Or, if you won’t listen to reason, at least try to go to a “best value” school, even though the every idea is a fantasy. There are no good deals on law school. Really. But then, what job or profession really is awesome these days? Maybe jobs that give unlimited vacation would be nice, but they don’t address the much bigger problem that “the U.S. is alone in the industrialized world in that millions of mainly low-wage workers have no paid vacation at all.” Little facts like that, and that little problem of mass incarceration and what appears to be becoming a domestic war on Islam (the ugliest current manifestation of our stadium mob mentality) and you really have to wonder: what the hell is wrong with us in the U.S.? At least we have no shortage of funny books to read. But, wait, even great fiction loses its charms when judges are getting removed mid-trial for making rulings the government dislikes. WTH, people? And someone thinks eye-rolling should be considered disorderly conduct? Don’t tell anyone in my courtroom or the State’s Attorney will have to be locked up for committing disorderly conduct about a hundred times every day. Can’t I just move to Finland? It’s the world’s best country! It’s going on two months since I gave my iPhone a coffee and cream bath. I put it in rice for a few days and it seemed to work fine for a day, then… Gone. When it will turn on, it reboots itself randomly. When it’s not rebooting itself, app store apps don’t launch. The phone won’t ring and if I make a call the phone freezes when I hang up. Grrr. I thought maybe if I took it apart I could see where the coffee was and try to clean it out. I bought an iPhone battery and repair kit with screwdriver and suction cup and “spudgers” and got to work. Using these helpful directions from iFixit, and these, I pulled everything apart and replaced the battery. While inside, I looked for evidence of coffee or cream residue but saw nothing obvious. I hoped maybe just the new battery would do the trick, but, well, no. It seems to reboot less, and it holds a charge better, and the battery monitor displays correctly when it’s charging or not (which wasn’t true before), but it still doesn’t work. As a final effort, I tried a restore to factory settings and that wouldn’t work. First I got error 1603, then error 1013. The latter apparently indicates “a hardware issue with your device.” You think? Yeah, thanks. 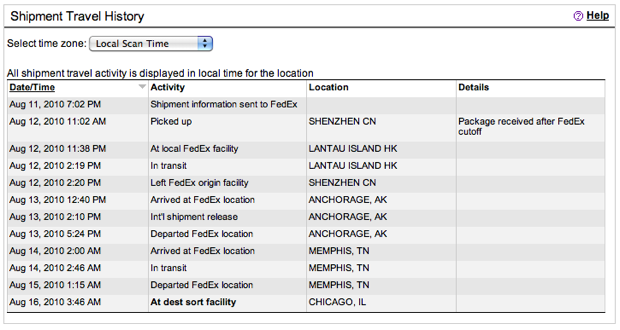 Good thing my very own iPhone 4 just arrived in Chicago this morning, huh? That video is too old to have appeared on Devour, but “Words” is maybe the best thing I’ve seen from the new service. Incensed by a “no tresspassing” sign, Jeff Deck launched a cross-country trip to right grammatical wrongs. Really, guys? And people are actually buying the book you wrote about this? Really?